If you read my column with the Donegal News, you may have noticed that I have been doing some reviews of late. The latest being Hyperbaric Therapy in Belfast. Due to the positive feedback it received, I have decided to test other treatments over the next two weeks that promise to ease pain or reduce the effects of harsh treatments/medications. Rather than merely suggest that you try them I thought it would be useful if I test them first. Those who have gone through menopause will be aware of the effects it has on the body. I hated them all equally but the changes to my skin bothered me on a regular basis so I decided to do some research. I found a treatment called CACI which looked interesting. CACI (Computer Aided Cosmetology Instrument) is an award winning treatment.Hailed the world over as the industry’s definitive alternative to Botox. 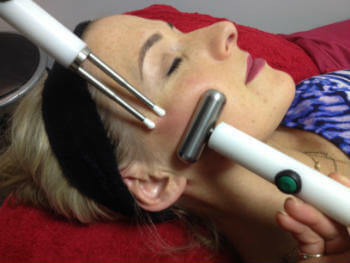 Results are so dramatic that CACI has become known as “The non-surgical face lift”. and has attracted a unique celebrity following making it the most publicised beauty treatment in the industry’s history. 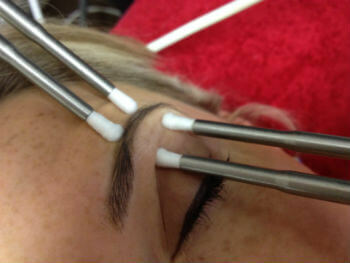 CACI celebrity clients include Jennifer Lopez, Jennifer Aniston, Lisa Snowden and Suzanne Jackson. Along with treating the signs of skin ageing, CACI treatments also work to improve sun-damaged skin, stretch-marks, acne and blemish scars. After ten minutes Seema returned and my treatment was complete. Time absolutely flies once you enter the room, the entire process takes roughly one hour but it only feels like twenty minutes. It is recommended you have ten treatments to begin with and follow up with one monthly maintenance treatment however many clients have reported to have noticed a difference after their first session. I noticed a definite difference and was shocked as I genuinely didn't expect it. My eyes were a little puffy initially but once that subsided I could see much more of my eyelid. My whole eye area had opened up. I returned last Tuesday for my second treatment and noticed how fresh I looked the following morning. I was attending an event quite early in the morning and expected to be greeted with tired eyes when I looked in the mirror but instead I looked like I had been awake for hours! It is early days for me and I plan to continue treatment but so far I am happy to say with complete honesty that this treatment works! Jennifer Aniston is such a strong believer in it that she actually bought her own machine! Hmmmm do you think Santa would bring me one for Christmas? A girl can dream! To make an appointment with Seema you can visit her Facebook page facebook.com/indulgencelaserandbeauty/ or call 085 7106507.